The White House is celebrating the Senate Budget Committee’s passage of the Republican tax plan, which will advance the sweeping tax package to the full Senate. The committee voted 12-11 to advance the bill. GOP leaders hope to have the full Senate take it up later this week. The Senate Budget Committee has advanced a sweeping tax package to the full Senate, handing GOP leaders a victory as they try to pass the nation’s first tax overhaul in 31 years. The committee voted 12 to 11 to advance the bill. Two committee Republicans had said they were considering voting against the measure. But after President Donald Trump personally lobbied Republican senators at the Capitol Tuesday, the committee passed the bill with little fanfare other than a few protesters who tried to disrupt the committee meeting. GOP leaders hope to have the full Senate take up the bill later this week. The tax package blends a sharp reduction in top corporate and business tax rates with more modest relief for individuals. Sen. Susan Collins of Maine says she has won support to amend the Senate’s sweeping tax bill allow homeowners to deduct at least a portion of their local property taxes on their federal tax returns. 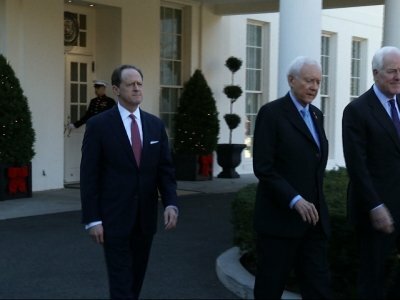 President Donald Trump attended a Senate Republican luncheon Tuesday in an effort to persuade senators to support the tax package. Afterward, Collins said Trump and other GOP leaders agreed to the property tax provision. The current Senate bill completely repeals the state and local tax deduction, which helps reduce the tax bills of more than 43 million families. Collins said the Senate bill would be amended to allow homeowners to deduct up to $10,000 in property taxes, which is similar to a provision in the House-passed bill. A group of moderate Senate Democrats are asking Republicans to work with them to refashion their tax bill into legislation they say would truly help the middle class. Sen. Joe Manchin of West Virginia, who led the group, tells Republicans: “We can get you to 70” votes on a bill. Democrats weren’t included in the crafting of the tax overhaul legislation, and they have attacked it as benefiting big corporations and the wealthy. Several of the moderates had been actively courted by President Donald Trump on the tax overhaul in recent weeks, invited to meetings and dinners at the White House and trips with Trump on his plane. Manchin, Joe Donnelly of Indiana and Heidi Heitkamp of North Dakota are from states easily carried by Trump in the 2016 election. They are up for re-election next year. The House’s chief tax-writer says ending the “Obamacare” requirement that everyone have health insurance — an element of the Senate bill — is a move the House also is likely to accept. Rep. Kevin Brady, chairman of the Ways and Means Committee, made his comments Tuesday as Senate Republican leaders pushed to pass their bill this week. It would eventually have to be reconciled with the tax measure recently passed by the House. Republicans are struggling to win over resistant GOP senators to a sweeping tax bill that President Donald Trump and their party have set as a vital political goal. Trump, who has assured lawmakers there will be changes, is traveling to Capitol Hill on Tuesday to personally lobby Republican senators. Senate GOP leaders hope to pass the bill this week. Anxious to pass a tax overhaul package by year’s end with an eye to the 2018 elections, Trump and the GOP leaders scrambled Monday to make changes to the Senate version to woo the Republican holdouts. Republicans have only two votes to spare in the Senate, where they hold a 52-48 edge, and anticipate Vice President Mike Pence breaking a tie, if needed.